Watch "A Conversation with Dr. Dan Olweus"
Dr. Dan Olweus is a research professor of psychology affiliated with the Research Center for Health Promotion (HEMIL) at the University of Bergen in Norway. He has worked on bullying problems among schoolchildren and youth for nearly forty years. His earliest scientific study of bullying was published in Scandinavia in 1973 and the United States in 1978 as a book titled, Aggression in the Schools: Bullies and Whipping Boys. In the 1980s, Dr. Olweus conducted the first systematic intervention study against bullying in the world, which documented positive effects of what is now the Olweus Bullying Prevention Program. The success resulted in Dr. Olweus leading a nationwide government initiative to implement OBPP throughout all Norwegian elementary and junior high schools. Dr. Olweus is generally recognized as a pioneer and founding father of research on bullying problems and as a world-leading expert in this area both by the research community and by society at large. He also was the first to study teachers who bully students. His book, Bullying at School: What We Know and What We Can Do has been translated into fifteen different languages. Dr. Olweus has received a number of awards and recognitions for his research and intervention work, including the "Distinguished Contributions to Public Policy for Children" award by the Society for Research in Child Development (SRCD). He has been a fellow at the Center for Advanced Study in the Behavioral Sciences (CASES) in Stanford, California. Susan P. Limber is the Dan Olweus Professor within the Institute on Family and Neighborhood life at Clemson University. She is a developmental psychologist who received her master's and doctoral degrees in psychology at the University of Nebraska-Lincoln. She also holds a master's of legal studies from Nebraska. Dr. Limber's research and writing focus on legal and psychological issues related to youth violence (particularly bullying among children), child protection, and children's rights. She directed the first wide-scale implementation and evaluation of the Olweus Bullying Prevention Program in the United States and co-authored the Blueprint for the Bullying Prevention Program and Cyber Bullying: Bullying in the Digital Age, as well as many OBPP products and articles about bullying. In recent years, Dr. Limber has directed the implementation of the Olweus Bullying Prevention Program in the United States. She also provides consultation to the National Bullying Prevention Campaign, supported by the Health Resources and Services Administration. In 1997, she received the Saleem Shah Award for early career excellence in psychology-law policy, awarded by the American Psychology-Law Society of the American Psychological Association (Division 41) and the American Academy of Forensic Psychiatry. In 2004, Dr. Limber received the American Psychological Association's Early Career Award for Psychology in the Public Interest. In 2011, she received the Distinguished Career Award for outstanding Contributions to Public Service Psychology, awarded by the Division of Psychologists in Public Service, American Psychological Association. Vicki C. Flerx helped to bring the Olweus Bullying Prevention Program to the United States and now is a Program Director for the program. She also is a research assistant professor at the Institute on Family and Neighborhood Life, Clemson University, Clemson, SC. She has expertise in both public and mental health. Prior to earning her doctorate in public health, Dr. Flerx spent fifteen years as a therapist working in psychiatric settings and focusing on women and youth who were victims of abuse. In addition, she has conducted research in family violence, including intimate partner violence, child abuse, and children exposed to domestic violence. 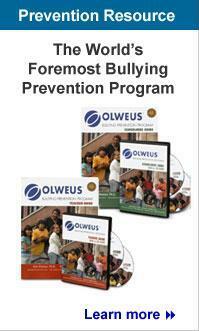 She now trains and consults nationally to support the dissemination of the Olweus Bullying Prevention Program. Dr. Flerx co-authored the Olweus Bullying Prevention Program Schoolwide and Teacher Guides (and accompanying CD-ROMs and DVDs), and the Olweus Bullying Prevention Program Class Meetings and Individual Interventions: A How-To Guide and DVDs. Nancy Mullin is the Director of Bullying Prevention Solutions in Raleigh, NC where she provides consultation and training about bullying prevention and intervention for preschools and grades K-12. She became one of the first Olweus Bullying Prevention Program U.S. certified trainers, and since 2000 has partnered with Clemson University in helping to design and conduct OBPP trainer certification courses and materials, consulting to trainers, and developing Olweus Bullying Prevention Program materials. She also coordinated the Massachusetts Bullying Prevention Initiative, the first statewide implementation of the Olweus Bullying Prevention Program in the United States (2000-2002). In addition to co-authoring the Olweus Bullying Prevention Program Schoolwide Guide and Teacher Guide, she has co-authored numerous other OBPP products. Her publications also include The Olweus Companion Bibliography for Grades K-12, Teaching Children to Care: An Empathy Curriculum for Preschool, and Quit It! : A Teacher's Guide on Teasing and Bullying for Use With Students in Grades K-3. Ms. Mullin's nationally known work emphasizes linking bullying prevention themes to classroom curriculum and reducing the negative impact of bullying and gender-role stereotypes on school climate and student performance. Jane Riese is the Director of Training for the Olweus Bullying Prevention Program in the United States and is a research associate with Clemson University's Institute on Family and Neighborhood Life. Ms. Riese participated in the initial OBPP trainer certification process in 2000 and helped to coordinate the first U.S. Trainer Certification Course held in 2001 in Pennsylvania. She currently oversees Olweus trainer certification, recertification, and the work of Olweus Technical Assistance Consultants. Ms. Riese is co-author of the OBPP Trainer's Manual, OBPP Schoolwide Guide, OBPP Teacher Guide and many other OBPP print and online products. In collaboration with Norwegian authors, Ms. Riese was the lead architect to adapt and design the Olweus Quality Assurance System and the OQAS School Manual and Site Visit Guide for a pilot project for the certification of Olweus Schools the United States. A licensed social worker and prevention educator, Ms. Riese developed and directed dialogue-based restorative justice programming in her community and was the director of a prosecution-based victim services program. She serves on the Governor's State Board of Social Workers, Marriage and Family Therapists and Professional Counselors in Pennsylvania. Marlene Snyder is the Director of Development for the Olweus Bullying Prevention Program in the United States and is a research associate professor at the Institute of Family and Neighborhood Life at Clemson University. She has served as the national point of contact for Olweus program information and has trained many OBPP Training Certification Courses since 2000. Most recently, Dr. Snyder formed and facilitated the High School Advisory and has worked to translate those recommendations for OBPP High School Implementation. She also oversees work of the OBPP State Leaders and establishment of partnerships with other national organizations. Dr. Snyder has co-authored the OBPP Schoolwide Guide, Teacher Guide, Trainer's Manual, and many other OBPP print and online products. Dr. Snyder consults regularly with a wide variety of professional and community organizations on a range of topics related to bullying prevention and intervention. She is the founding president of the International Bullying Prevention Association. Dr. Snyder has served as a national and international conference speaker, trainer, and technical assistance consultant for educational, mental health, child welfare, and juvenile justice agencies, as well as parent education organizations. She served on the National Board of Directors for CHADD (Children and Adults with Attention Deficit Disorders and authored, ADHD & Driving: A Guide for Parents of Teens with ADHD. Presently, she serves on the Welcoming Schools National Advisory Board.